When children have moved beyong finger painting it’s perfect time for a creative birthday party that will truly be a work of art. 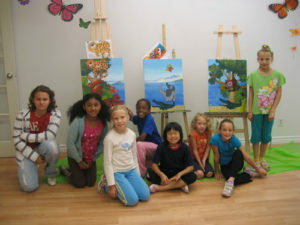 Alecia had celebreated her 9th Birhday at Art One Academy. For her birthday project she picked to create a Jungle theme mural with help of her friends. Children had fun creating the mural and in the process had learned how to mix primary colors and practiced applying acrylic on canvas. Alecia is bringing home a great mural that reminds her of a great time she had with her friends.